Despite never seeing him play, Reg Allen is a legend of mine, and arguably, Queen’s Park Rangers’ greatest ever goalkeeper. 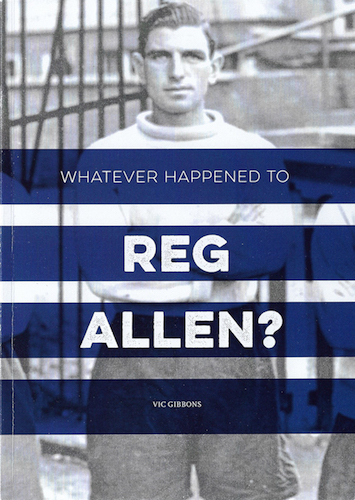 Vic Gibbons’ long awaited book: ‘Whatever Happened to Reg Allen?’ was published recently and he kindly forwarded me a copy. ‘Whatever happened to Reg Allen? This has been a personal quest, which really began on the day of his benefit match between Queen’s Park Rangers and Manchester United in 1954. Even QPR appeared to know very little of his whereabouts at that time. Their programme notes for the benefit game simply mentioned that Reg Allen was in hospital recovering from illness and the Club wished him all the best! My search for the answer to the question could hardly be described as intensive during most of the years that followed, but the nagging question was always there and it was one that I would ask former QPR players over the years such as Arthur Jefferson who, like me still living in West London, could throw no further light on the matter. It was really only the publication of an article in the QPR match programme by Derek Buxton concerning the club’s “best ever” five goalkeepers that the vexed question became a virtual obsession of mine. The feature about Reg Allen in that article by Derek concluded that he had prematurely retired as a consequence of a serious head injury. However, I was shorty afterwards able to establish from Manchester United’s records that his illness had little, if anything, to do with physical injury. Excellent Stuff. I have already got my copy. I remember watching Reg play, also Arthur Jefferson who appeared to me to be a very robust full back. I recall seeing Arthur take a free kick which knocked out Horace Woodward who was playing for Spurs at that time. He later signed for the R’s, I think he was a centre half. In those days I also remember Arsenal reserves playing at the Bush fielding Jim Holton, Jimmy Logie and other well_- known stars of the day . I also saw Raich Carter and Jimmy Dickinson at the Bush. After another match a little later, I sat next to Stan Gullen (who had played in goal that day) on my way home by tube and chatting about the game. What chance of doing that these days when so many overpaid “stars” seem out of touch with the fans. A few years ago I wrote to one of our recent strikers asking for an autograph, enclosed a stamp addressed envelope, and he couldn’t be bothered to reply.